Also check out how we talk gender stereotypes with Mulan! Earlier this week I used this as a warm up task (about 20 minutes). I was incredibly impressed with the class discussion. Not only did I want this assignment to empower girls but I also wanted my students to understand the power of seemingly harmless words and phrases. I knew this single assignment wouldn’t change their actions overnight but I hope they are at least starting to be a bit more intentional with how they communicate. Alright, now that I’ve shared about my experience teaching this lesson, let’s get down to the details. First things first, if you haven’t watched this video, stop and watch it! Isn’t this video amazing and the message so powerful! I personally think it reaches beyond the goal of empowering girls, to the goal of empowering everyone who is label as inferior simply because a certain characteristic is not perceived as strong, adequate, or acceptable. As your students work through this assignment, challenge them to make this deeper connection to their personal lives. Here are a few examples from my students. I must say I was beaming with pride as I read their responses! First, my students answered the “pre-video” questions (initially I wanted them to act out different actions “like a girl” but we had a limited amount of time – however, in the future this would also be a great way to add some activity into the non-PE classroom). Then, we watched the video. Some had seen it but many were first-time viewers. As it played I tried to keep my emotions in check, I almost didn’t make it:) Once the video was done, they independently answered the remaining questions on the first page. After the kids had enough time to thoroughly complete the first page, we paused to discuss. The lesson ended with the students writing their final reflecting and sharing about how this video/conversation would affect their actions in the future. I thoroughly enjoyed the discussion and reading over their worksheets. My students made some powerful connections. I thought it was especially interesting to hear what other terms similar to “…like a girl” students listed on their paper. Many said things like, “you’re a such a crybaby,” “that’s so gay,” “dumb blonde,” etc… On the whole, I felt like my kids were being quite raw with their feelings and emotions, which led to a powerful discussion. It actually ended up being a great lead up to today’s viewing of Malala’s interview with Diane Swayer. 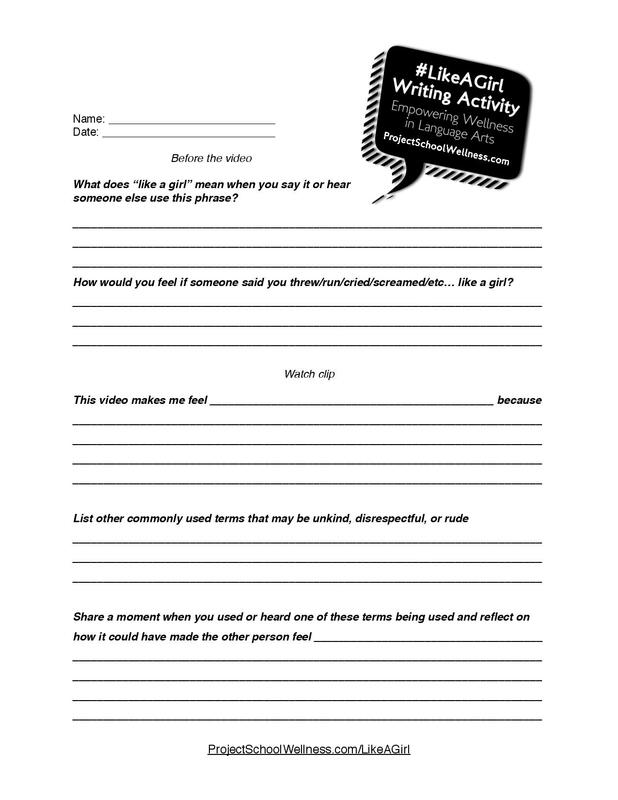 Click here to download #LikeAGirl activity worksheet!